This tutorial will teach you how to perform Linear Regression using SPSS 16.0. The Dataset and steps are taken from here. First, we will start off with the definition of Linear Regression. In statistics, Linear Regression is an approach to modelling relationships among variables where scores on one variable are predicted from the scores on a second variable. Whereas the variable predicted is called criterion variable (and referred as X), that on which prediction is based is named predictor variable (and referred as Y). In case there is only one predictor variable, the prediction method is called simple regression. 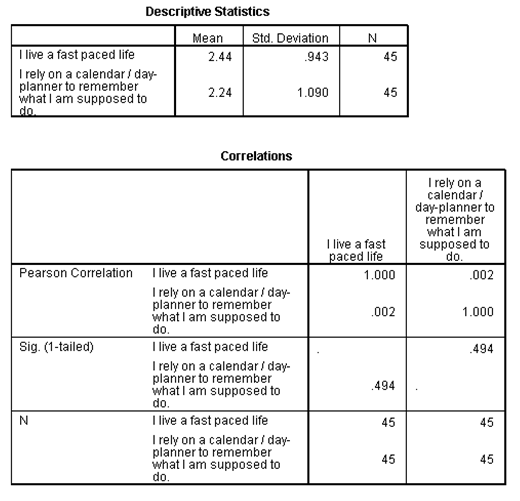 Let assume that we want to find out whether there is a correlation between these two variables: “I live a fast paced life” ( criterion variable) and “I rely on a calendar” (predictor variable). In a nutshell, we want to predict value of the “I live a fast paced life” variable given the value of the “I rely on a calendar” variable. 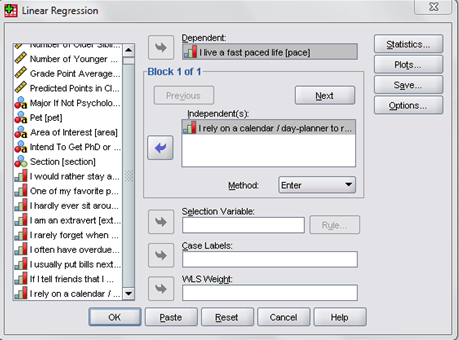 If more than one variable is included in the Indipendent box, Multiple Regression will be performed. The Descriptive Statistics part returns the mean, standard deviation, and observation count (N) for dependent and independent variables. The Correlation part, instead, shows the correlation coefficients. The first row (Pearson Correlation) provides the correlations between the independent and dependent variables, whereas the second row returns the significance of the correlation coefficients. The last row gives the number of observations for each of the variables, and the number of observations including values for all the independent and dependent variables. 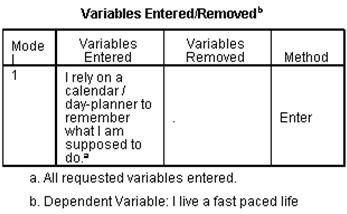 The Variables Entered/Removed area simply shows what are the variables taken into account (dependent and independent) , whereas the Model Summary is used when performing multiple regression (which will be treated in another tutorial/experiment). Capital R is the multiple correlation coefficient that tells us how strongly the multiple independent variables are related to the dependent variable. ANOVA (Analysis of variance) provides information about levels of variability within the regression equal. In a nutshell, it denotes whether the regression equation explains a statistically significant portion of the variability in the dependent variable from variability in the independent variables. The slope describes the direction and steepness of the regression line. For example, a slope equal to 0 is a horizontal line, whereas slope = 1 is a diagonal line from the lower left to the upper right. The intercept is is the expected mean value of Y when the independent variable is 0. 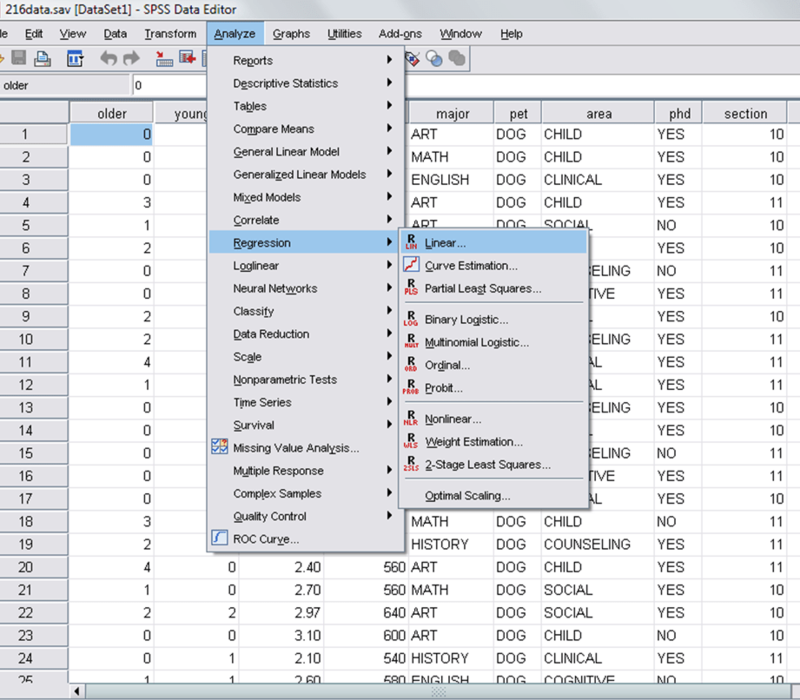 Next tutorial will show how to calculate Multiple Regression with SPSS.